School Birthdays: Go Big or Go Home. Hyperdiva’s Birthday in on Sunday. Her dad is taking her to disneyland for her gift from him. It’s been tight around here with graduation looming, and making sure everything is paid for. It wasn’t going to stop me. Each child always got a big presence from me their last couple years of elementary school. The last time they will have parties, and be kids before hormones and craziness of confusement kicks in. I asked her what she wanted. Of course ear piercing was her top choice, but again money. She then asked for a cupcake treat at school. I didn’t know if it was allowed because of new rules, but apparently, it was. No problem. 25 cupcakes right? Oh no. 56 kids, and two teachers since they have started switching classes. At first I thought of buying the cupcakes, but after calling for prices, I said um no. Of course, if I made them, I could make them my way……oh yeah. Your girl was all over this! Question was what would 56 10-11 year old like? 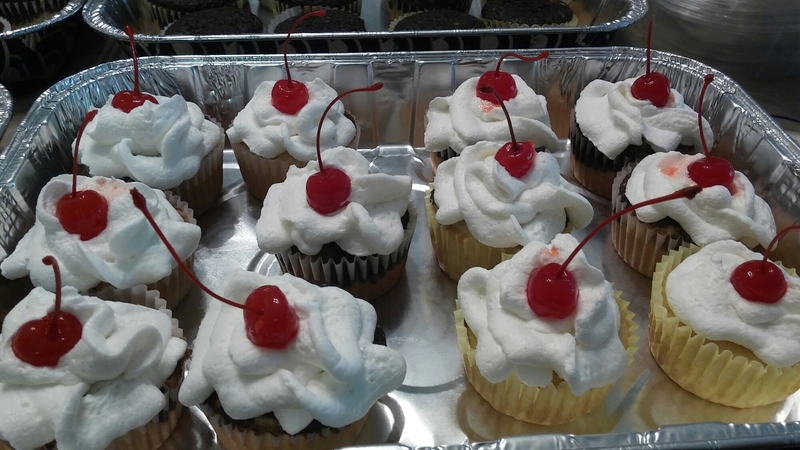 Banana Split Cupcakes! I mean who doesn’t like banana split cupcakes?! I began my craziness Wednesday night. These cupcakes were due Friday Afternoon. Of course my direct deposit didnt show up until Friday, no worries. I was crunched for time, but that’s nothing new. Normally, in my cake form, I made the cake portion to taste like bananas. Literally banana cake, but I didn’t feel like doing chocolate drizzle on each and every cupcake. Marble cupcakes. Genius. Half banana, half chocolate. I have my list of things, off to the store I go! I’m inside walmart. No marble cakes. Why me????? If you guys ever wanted to see a grown lady have a tantrum in public, you should have been there. It’s 6am on Friday. It’s bad enough I’m doing this the same day, let alone not having the supplies I need. Again, no worries, thought in two seconds……..french vanilla cake mix, add banana extract. Buy chocolate cake to swirl into other cake. Got it. Now before I get into the recipe itself, I’m going to give you the cost of the idea. For 60 cucpcakes: Two boxes french vanilla cake, 1.17/each. One box chocolate fudge cake, 1.28/each. Two jars cherries, 1.78/each. Two whipped cream containers, 1.98/each. 18 pack eggs, 2.98. Cucpcake liners, 1.00. Two pints of strawberries, 2.48/each. Three disposable cake pans, 2.98/each. Altogether it cost under 30 dollars versus my local bakery wanting close to 70 dollars. After everyone was gone we got the assembly line going and heated my oven to 350. I mixed the french vanilla cake, and added 1.5 teaspoons banana extract in the first mixing bowl. In a smaller mixing bowl, I mixed the chocolate cake mix. Then I lined my cupcake pans. Its easier to do it this way since you are goiving them to kids, less mess. Taking my 1/2 cup measureing cup, I began to pour in the french vanilla/banana cake mix first. One cup full equals out to two cupcakes. You want to make sure their is enough room to add the chocolate mix too. 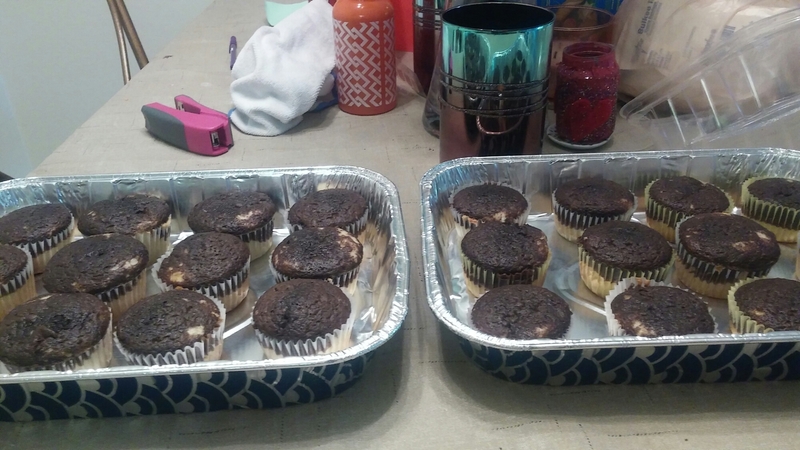 After pouring the first cake, you take 1 tablespoon of the chocolate cake mix, and pour into each cupcake. You can swirl them if you choose to, but I didn’t. Keep in mind, 10-11 year old aren’t that picky. Cake is cake, swirled or not, as long as it’s good. Next, rinse off your strawberries. Air dry. Slice the tops of the berry, and the tips of the berry off. Then dice into quarters. Place one quarter into each cupcake. Bake for 15 minutes or until a toothpick comes out clear. HUGE STEP! Take out oven and let them cool off. The cooler the better. I did this three times. I got done early, so that was good, but it was tiresome. Again, rather do it myself then pay a ton of money. Once the cucpakes cooled, I began the decorating process. Originally, I was going to get whipped crean cans. Again, walmart disaapointed me and didn’t sell them. Real close to being on cops at this point. Shopping way too early without coffee means no patience. Again, thought on my feet………buy the tub, transfer to a ziploc bag, cut a hole and squeeze out the cream. Ok crisis avoided. I placed these cupcakes in the cake tins(with lids). 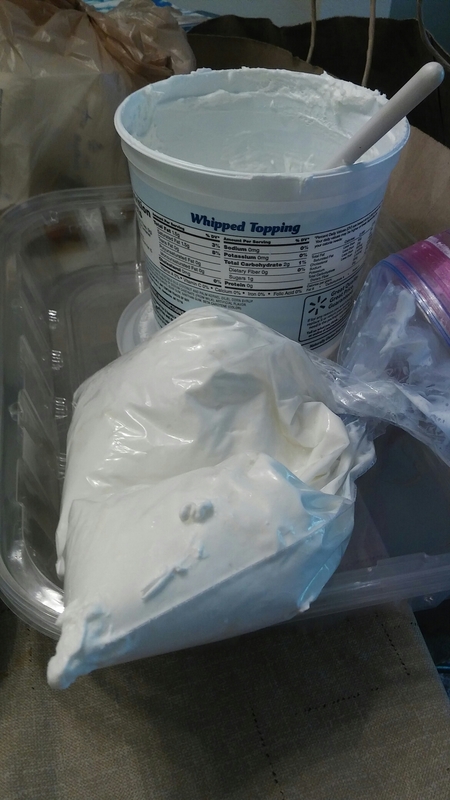 Then transferred the whipped cream to my freezer bags and cut two holes at the corner. Looked just like it came out the can. Ending it with a stemmed cherry on top. I probably wouldn’t have been so tired if I was cleaning inbetween, but I hate a dirty kitchen. Six pans of cupcakes by 2pm. Hyperdiva and her classmates loved it. 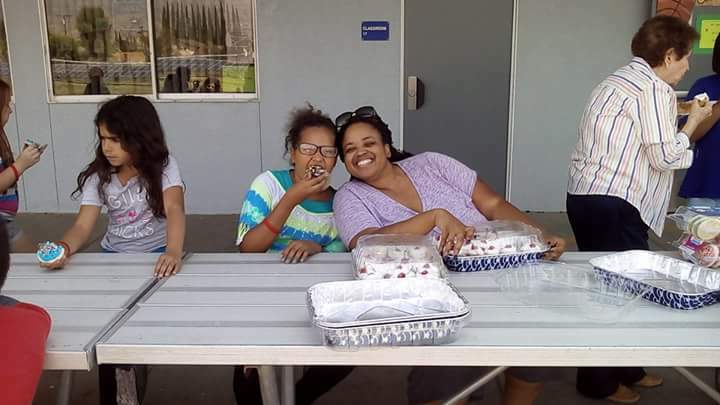 Her teacher missed out because he had to leave early, so between that and some kids missing school, I had leftovers. I may take him one on Monday. He’s a great teacher. My madness never ends I tell you, but the happy look on her face was well worth it. Mix as directed in bowls. If you choose to double the french vanilla cakes, that’s fine. If not, divide banana extract in half. One for each mix. 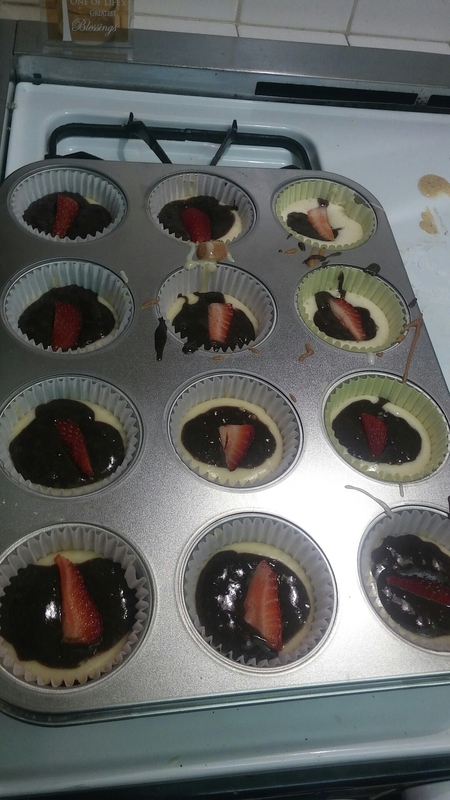 Pour 1/4 cup banana cake mix, one tablespoon chocolate cake mix, and one quarter strawberry into the cupcake cup. Bake as directed. Cool, and decorate with freezer bag full of whipped cream. Finish off with cherry. Serve chilled. You can store in refrigerator or freezer. Previous Post Quit blaming everyone else. Look at home.